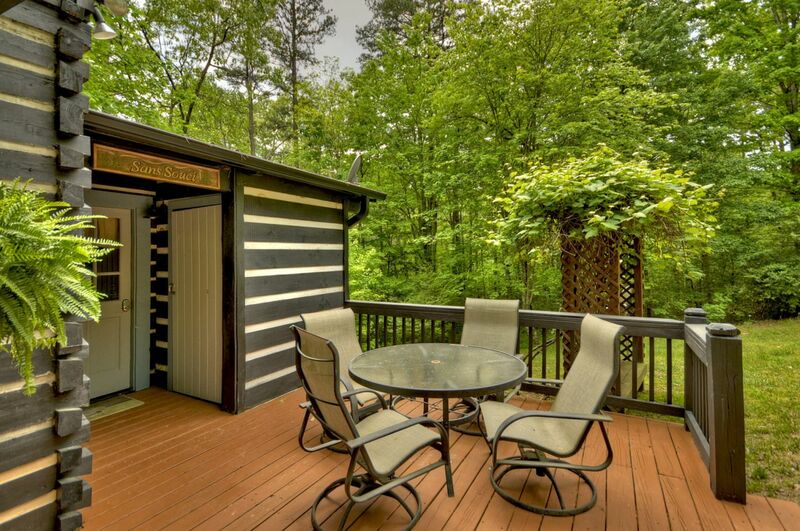 The name Sans Souci is French for "without a care" and this affordable cabin rental captures the carefree nature of the surrounding forest, tall pines and Ocoee River area. 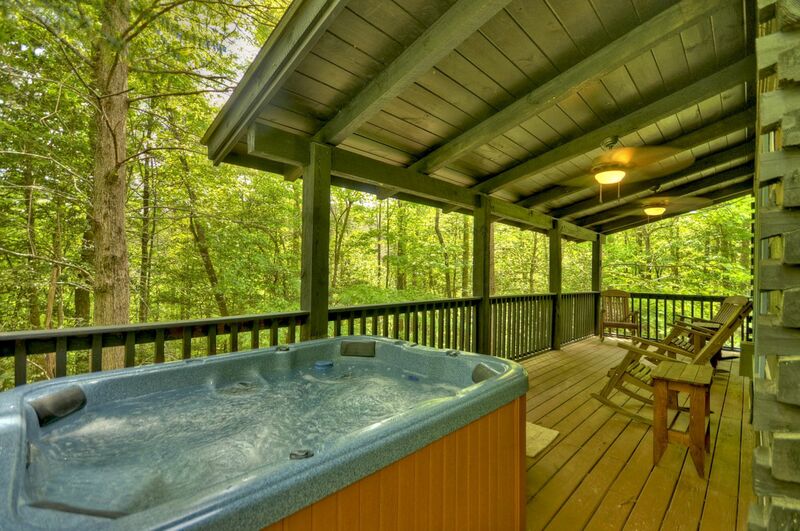 Venture out to Frog Mountain when not rafting or fishing the Ocoee River, and spend a relaxing evening enjoying a meal in nearby Copperhill or McCaysville. 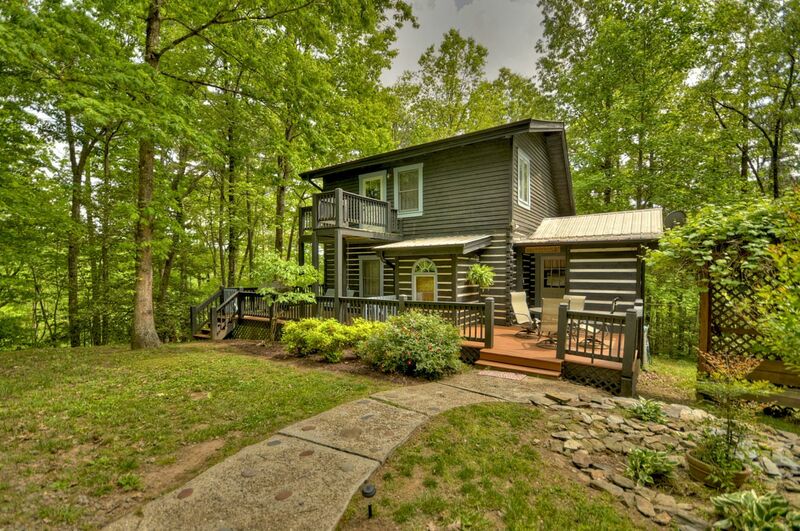 The lush landscaping around the cabin gives it a cozy feel in this natural forest setting. 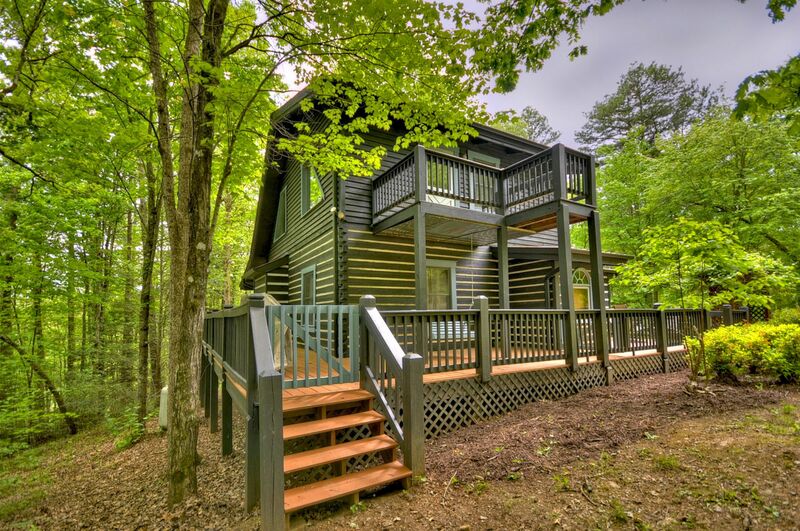 The vacation cabin is made from beautiful dark logs and held together with the craftsmanship of half dovetail notching and white chinking, for the truest old-fashioned architectural feel. 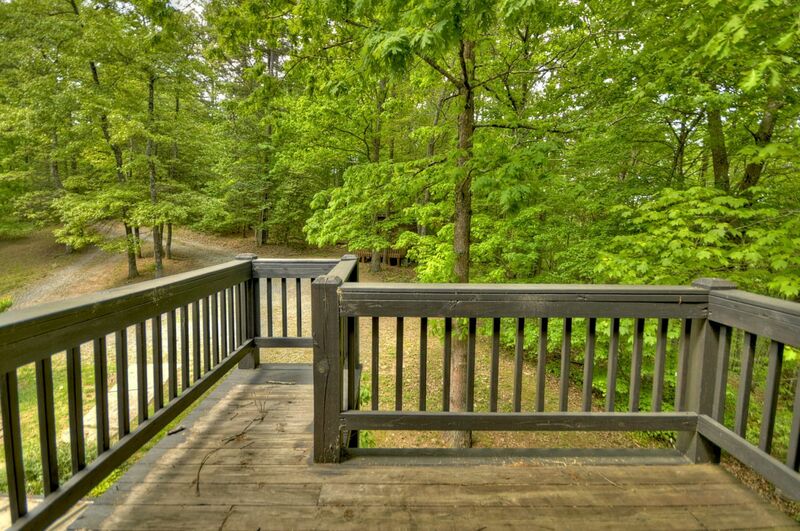 A wide deck nearly wraps entirely around the cabin, offering guests a place to lounge in rocking chairs and gaze out over the forest. 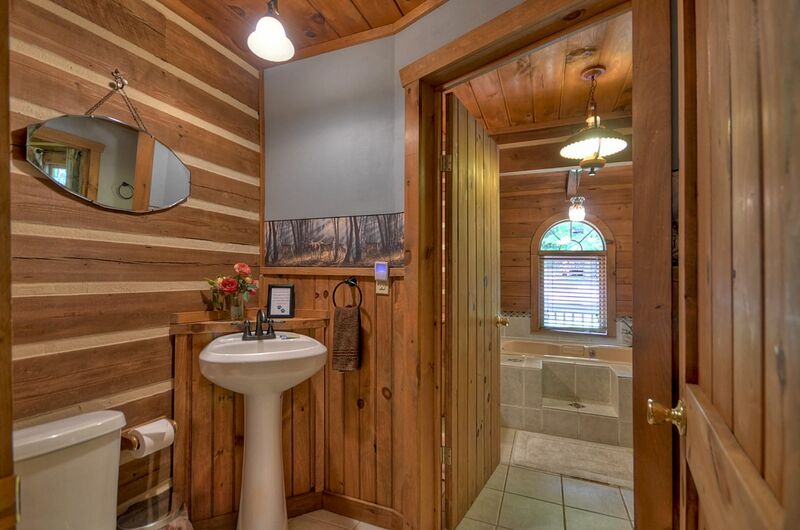 Inside your cabin, you are sure to be swept away by its simple rustic charm. 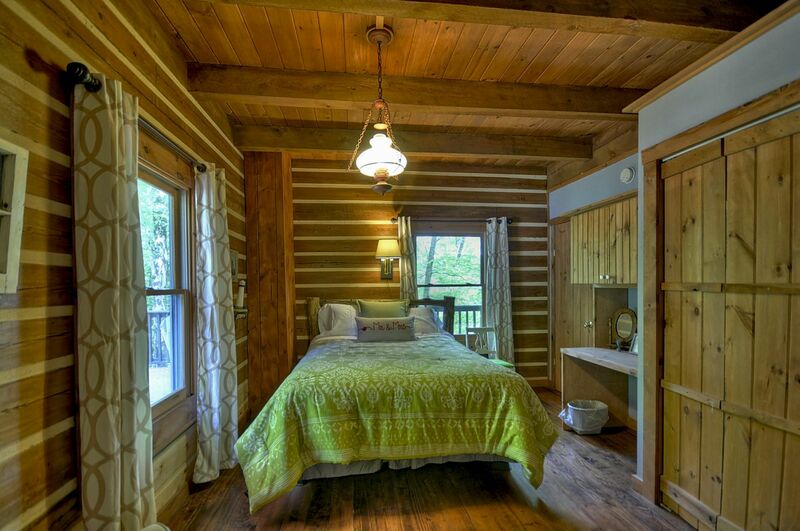 The cabin has gorgeous dark hardwood floors and tasteful decor throughout. 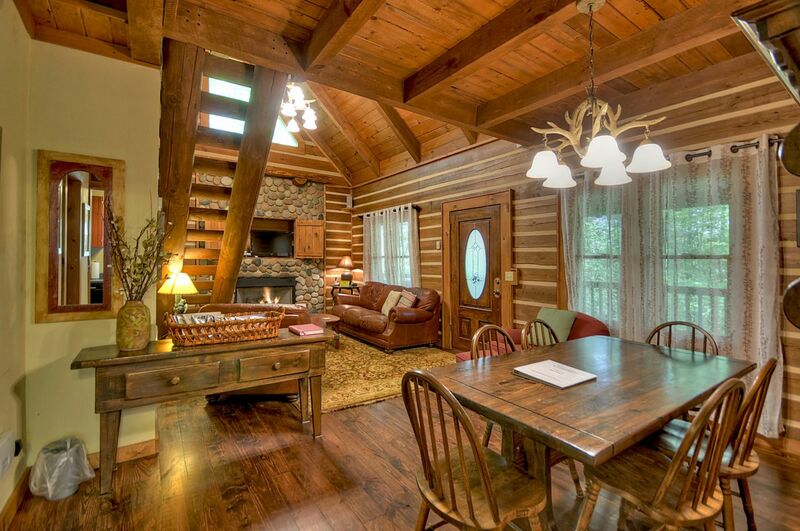 The furnishings of Sans Souci offer all the conveniences guests crave in a mountain getaway, but without exaggeration. 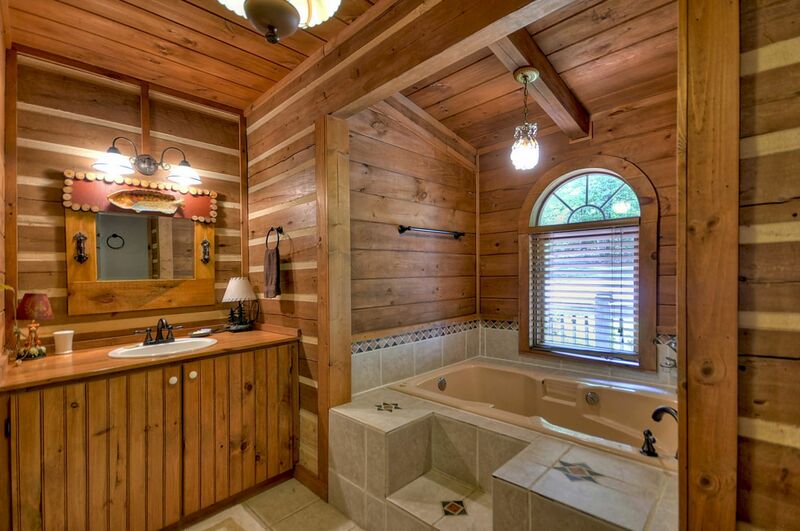 Its the tiny details, the unique touches that set this cabin apart. 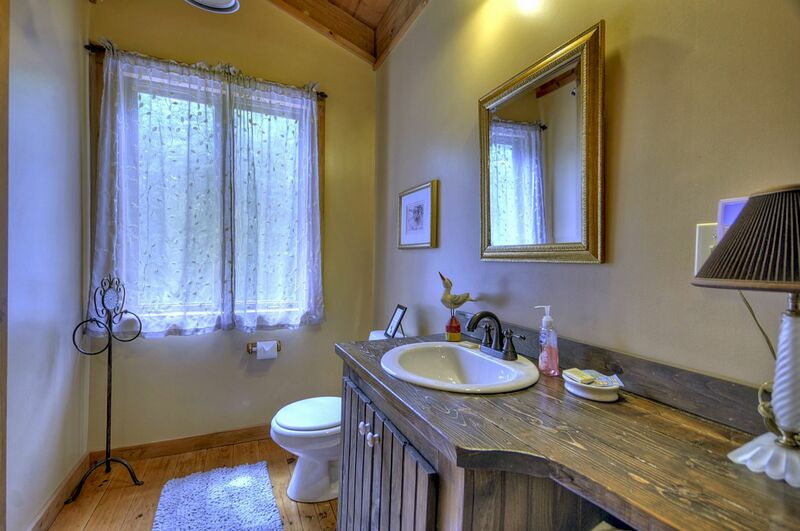 The spacious first floor bedroom has a large built-in desk area, and attaches to a bath with shower and separate bathroom area. 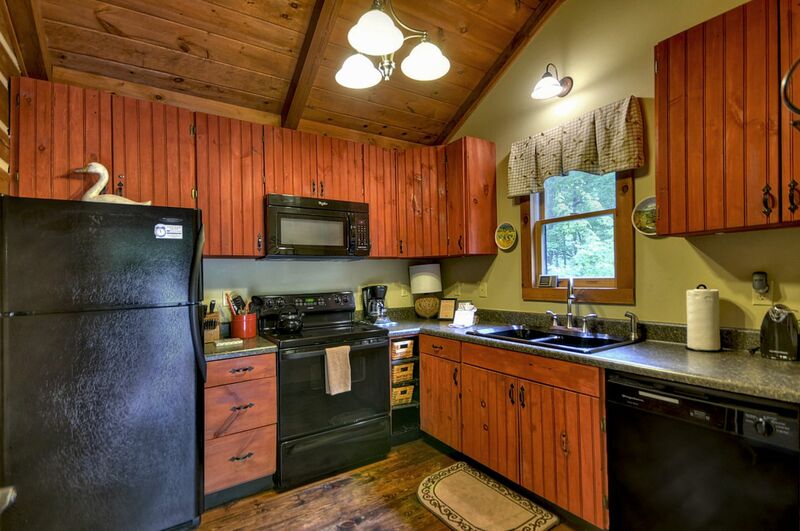 The cabin has a streamline black kitchen, and a dining area with a simple country dinette set. 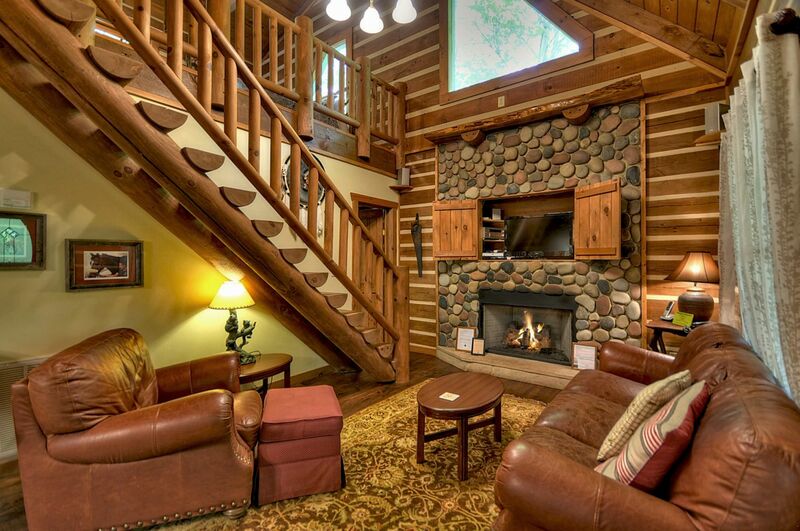 The den has a rock fireplace that stretches from the cabins first floor to the ceiling, and plush leather couches for lounging. 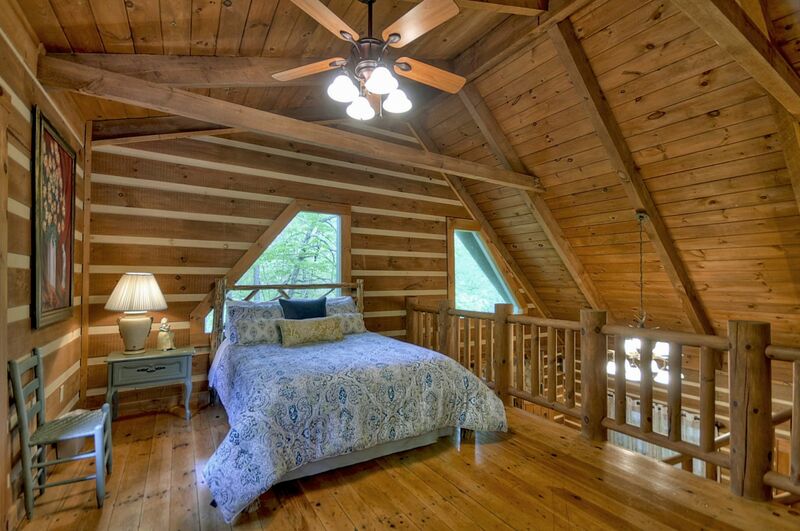 An impressive split log fireplace leads you to the second floor loft bedroom and bathroom with its private balcony and an exterior staircase extending to the porch below. 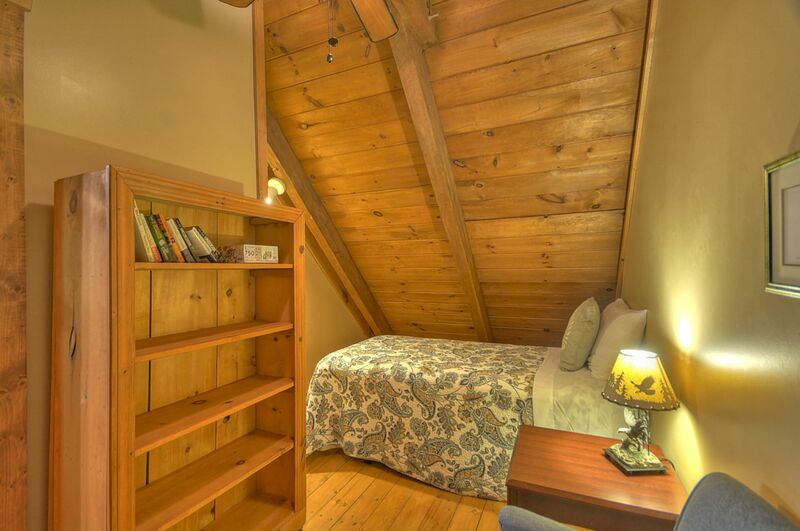 Guests who are eager to catch up on quiet and relaxation will be delighted to find the small bedroom off the loft that is the ideal spot for a peaceful afternoon nap. 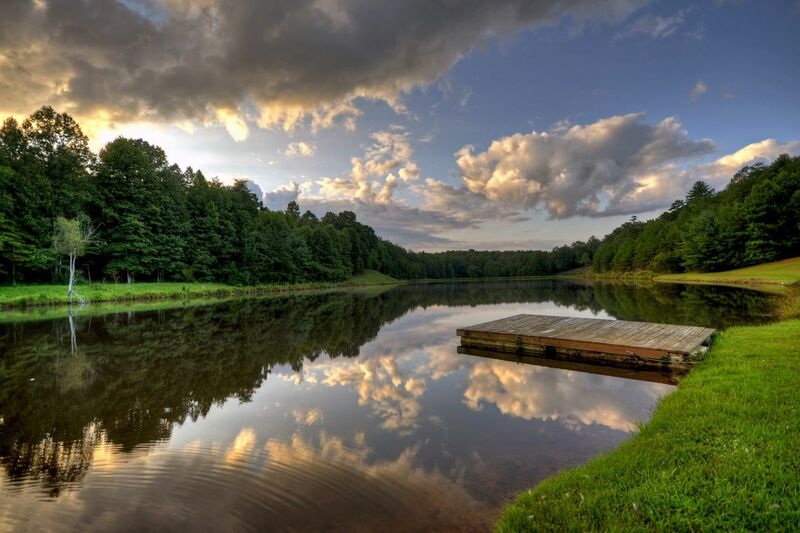 Whether you are looking for a mountain home to serve as a place of rest in-between whitewater rafting, horseback riding, and hiking excursions or if you are just hoping to find a quiet place to rest and recoup, Sans Souci is the spot for you! Note: Road to cabin is gravel and can be rough terrain. Please drive an appropriate vehicle. Also, cabin is on the same road as a pet rescue facility. 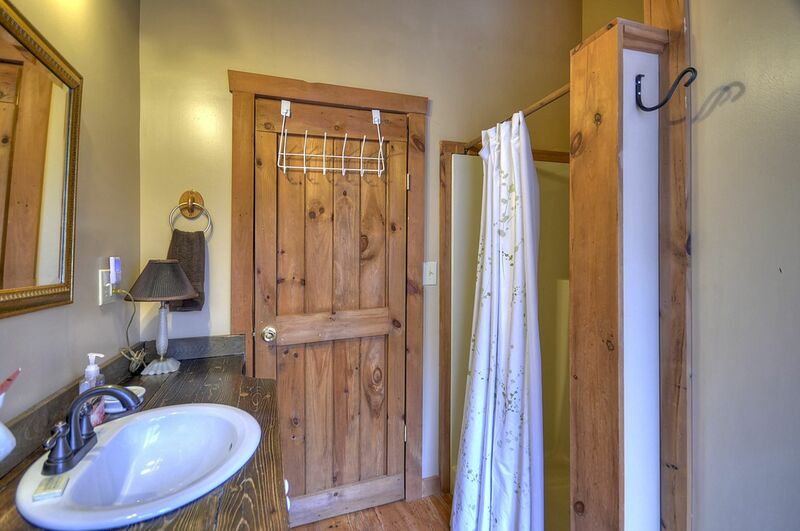 Amenities were well working and amazing!